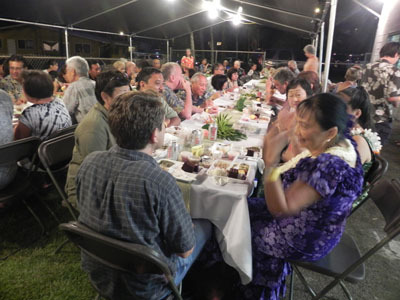 Mahalo nui to everyone who helped and supported St. John's annual lu‘au, held on September 6, 2014. This fundraising event is also a celebration of community! 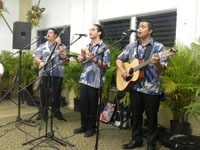 Special thanks to Kaiao (Kukahoʻomalu Souza, Liki Tavete and 'Ekolu Chang) for the wonderful music! And mahalo to Melody Loyola for these photos, which give a glimpse of the fun we had on this wonderful evening! 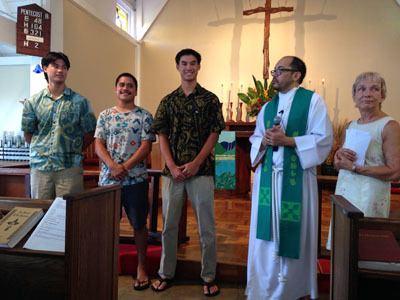 This year's scholarship awards were presented August 3 to Nicholas Young, William Young, and Kahala Lau. All three young men grew up as members of St. John's, serving the church first as acolytes and eventually becoming Eucharistic Lay Ministers. The scholarships, funded by donations, are awarded in memory of Fr. Darrow's life as an educator, his long service to St. John's by the Sea, and his special concern for Native Hawaiians pursuing higher education. Teena Urban and Fr. Leo Loyola congratulate this year's recipients. (Mahalo to Nahoa Lucas for the photo.) For information on how to donate to this scholarship fund, please see the How You Can Help page. In July, St. John's hosted two groups from elsewhere in the Pacific who were on O'ahu to attend a cultural festival at Hawai'i Pacific University that was organized by Pa-Ku`i-a-Lua, a halau of Hawaiians studying the ancient martial art of lua, led by Uncle Moses (Moki) Kalauokalani. One group, from New Caledonia, were with us July 6-10, after which they went to St. Elizabeth's where Fr. David Gierlach and the Lino 'ohana looked after them. A second group, from Papeete and Maupiti, stayed at St. John's July 10-19. In the attached photo, the latter joined us for Sunday Eucharist and contributed 3 hymns, some of them in Tahitian, French, and English. Our 3rd annual "Taste of St. John’s" was a delight for all. Themed "The Garden of Eden," the fundraiser took place in Ho`okano Hall transformed with strings of lights and leafy vines and warmed with the gorgeous music of Teresa Bright and of the group Vivo (with our own Ruth Shiroma Foster)! Attendees enjoyed wonderful foods, beverages, and conversations, while browsing and bidding in the silent auction. Mahalo nui to everyone who helped make this happen and to all who participated. All proceeds from this event will help St. John’s continue its presence and ministry in our community. 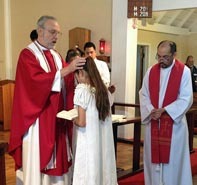 Luana was confirmed by Bishop Robert Fitzpatrick at St. John's by-the Sea Church on Sunday, February 16, during the bishop's annual visit. All of us join Lolana, Naomi, and Bella Sera in congratulating Luana, and thanks to Vicki Fay and Melody Loyola for these photos. The day of the bishop's visit, we were also graced by the presence of a high school choir from La Cañada, California! 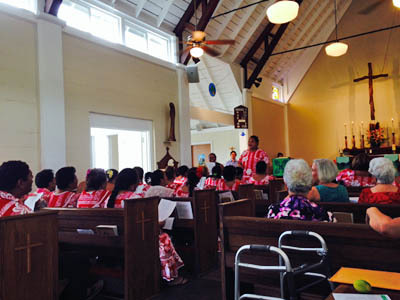 The young people sang anthems during the Eucharist and also performed for us down in Ho'okano Hall after a sumptuous potluck lunch provided by the congregation. Everyone thoroughly enjoyed the visit and the wonderful music. The organizer wrote to us afterward: "I'm so happy [the choir] had a chance to visit with all of you at St. John's by-the-Sea. Thank you so much again for being such a warm and welcoming host." Mahalo also to Vicki Fay for these photos.